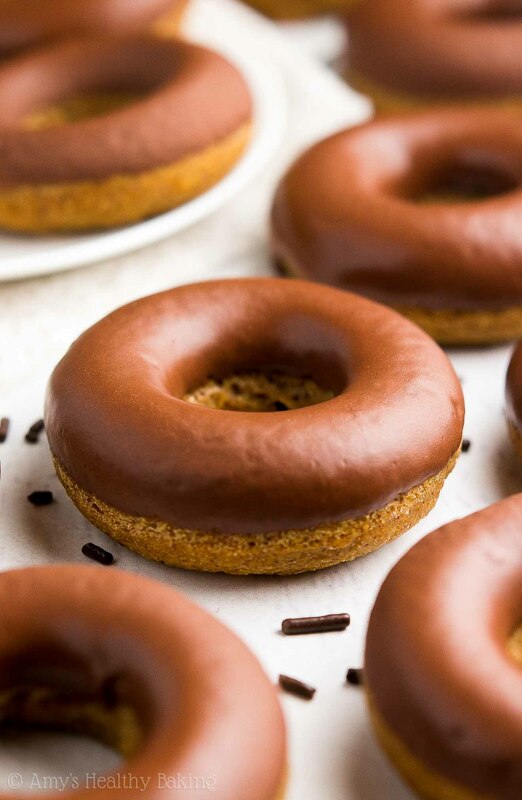 An easy recipe for supremely tender cake-style pumpkin donuts full of cozy spices & topped with rich chocolate glaze. Baked, not fried & just 41 calories! In the chemistry department at my college, nearly every professor expected their graduate students to work six days each week. With grad students’ teaching assistant commitments, papers to grade, and exams to oversee, coming in one day over the weekend was the only way we fit in enough hours for our own research—and still got some sleep during the week! My professor showed up at least one day during the weekend as well, and he left his office door open while typing emails and grant proposals in case we had questions. Everyone, including Bossman (our nickname for our professor! ), felt slightly more relaxed during those Saturdays and Sundays… Maybe because the building felt so peaceful without the undergraduates dashing from lecture hall to lecture hall! To add to that relaxed vibe, Bossman also brought in a huge pink cardboard box of donuts every Saturday morning and left them in the break room for us to enjoy. They came from one of the best donut shops in town, a little family-owned store not too far from campus. Even with so many tempting options, I always waited and grabbed mine right before I left in the evening. I knew I’d go through a sugar crash before lunch if I ate one of those donuts for breakfast instead! 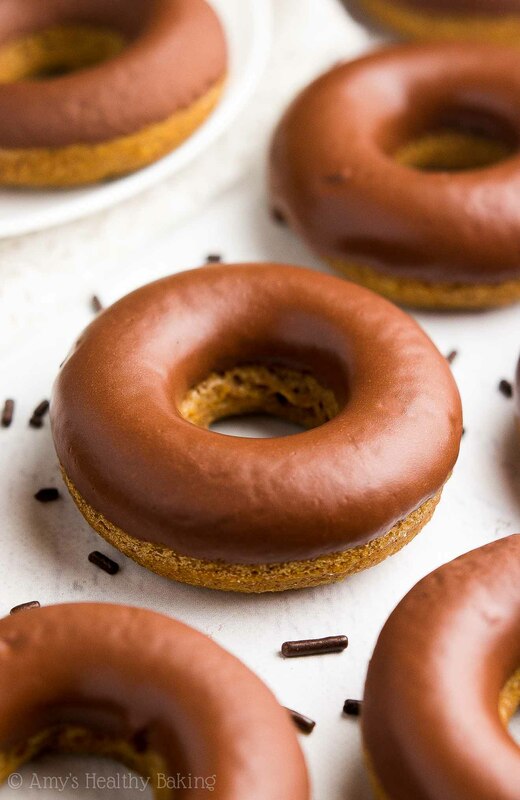 When I recently baked these Healthy Pumpkin Donuts with Chocolate Glaze one weekend, those fond memories of grad school resurfaced… But these homemade donuts are much healthier than the traditional store-bought ones we ate back then! 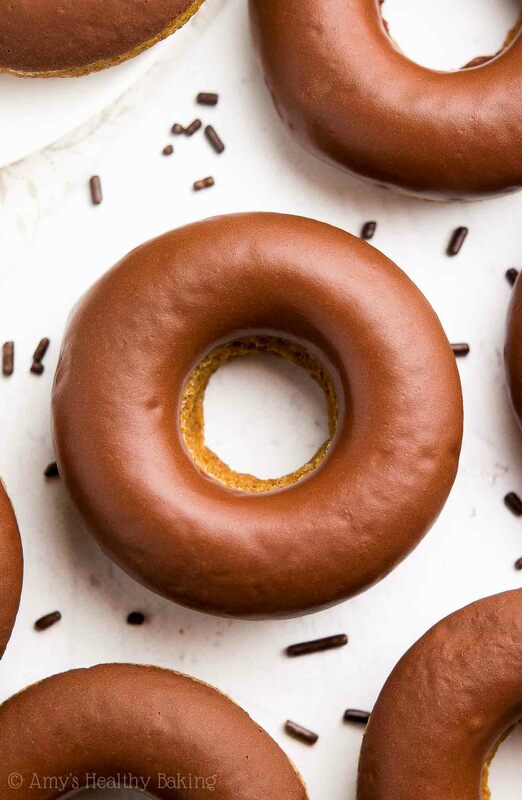 Even though they’re baked, not fried, they’re just as soft and tender as my favorite cake-style donuts… And they’re just 41 calories with no eggs, refined flour or sugar! Which means no sugar crashes with these, even when I eat them for breakfast! ?? 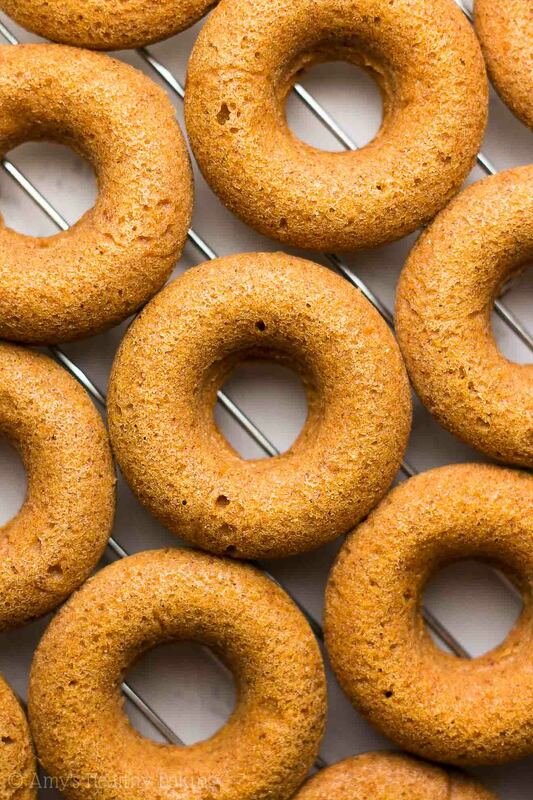 This healthy donut recipe starts with white whole wheat flour (like this!) and plenty of spices: cinnamon (this is my current obsession! ), ginger, nutmeg, and cloves. All the basic suspects in pumpkin and pumpkin spice recipes! Remember… White whole wheat flour is not a blend of all-purpose and whole wheat flours. It’s made exactly the same way as regular whole wheat flour, so it has all the same health benefits (like extra fiber!). The only difference? Regular whole wheat flour comes from a heartier variety of red wheat, whereas white whole wheat flour comes from a softer type of white wheat (hence the name!). You’ll also need plenty of pumpkin purée (like this… not pumpkin pie mix!). The pumpkin actually replaces the eggs, so the batter is perfectly safe to eat raw! If you’re like me and like to sneak taste tests… Then you’ll also add in Greek yogurt for a supremely tender texture and a protein boost. Yes—Greek yogurt adds the same moisture as extra butter or oil for a fraction of the calories! Of course… You can’t bake donuts without donut pans! These are the ones that I used. I absolutely love them, and they’re super affordable! Because they’re silicone and therefore somewhat flimsy, I just set them on a cookie sheet while baking, but the donuts pop right out of the molds. I own four—I love them that much! This glaze is so easy to make. I bet you could whip it up in your sleep! It’s just cocoa powder (like this! ), milk, vanilla, and a little more vanilla stevia (like this!) for sweetness. 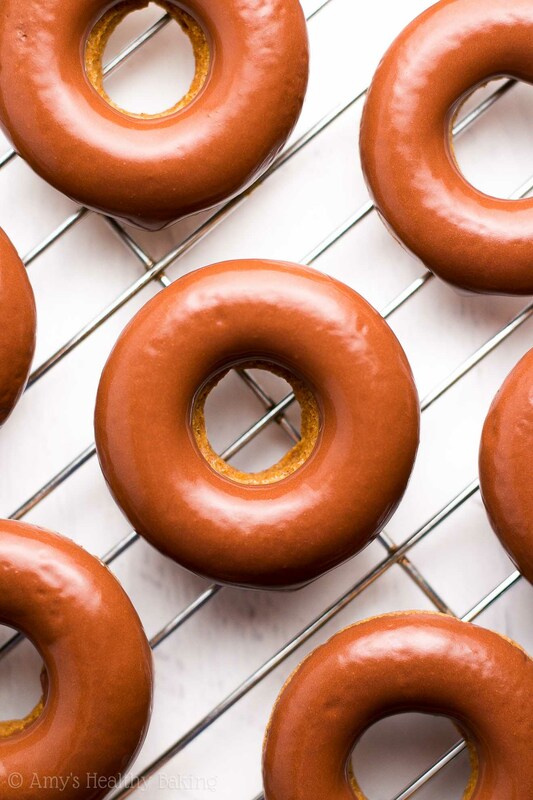 Once your donuts have cooled, simply dip them in the glaze, and set them on a plate to let the glaze set. Or add sprinkles… Or shower them with chocolate chips… Or eat them right away—I won’t judge! 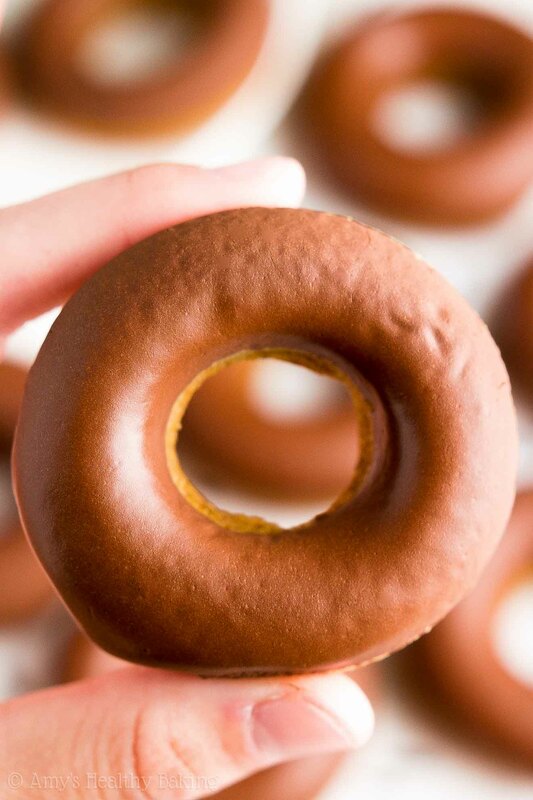 True donut perfection! ??? And when you make your own, remember to snap a picture and share it on Instagram using #amyshealthybaking and tagging @amyshealthybaking IN the photo itself! (That guarantees I’ll see your picture! ?) I’d love to see your donuts and feature them in my Sunday Spotlight series! 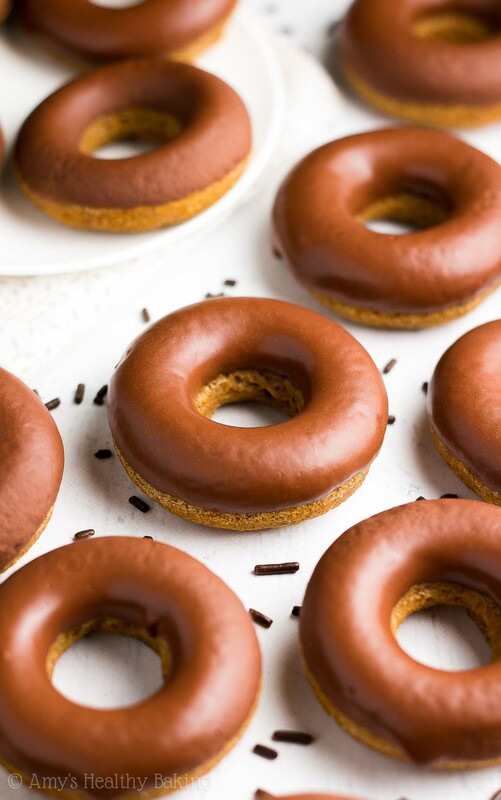 These are perfect for when you’re craving donuts but trying to stay away from the greasy fried ones! They’re supremely soft and tender, and they’re full of sweet pumpkin flavor and cozy spices. The rich dark chocolate glaze makes them even more irresistible! Leftovers will keep for at least 5 days if stored in an airtight container in the refrigerator. Preheat the oven to 350°F, and lightly coat 28 mini donut cups with nonstick cooking spray. 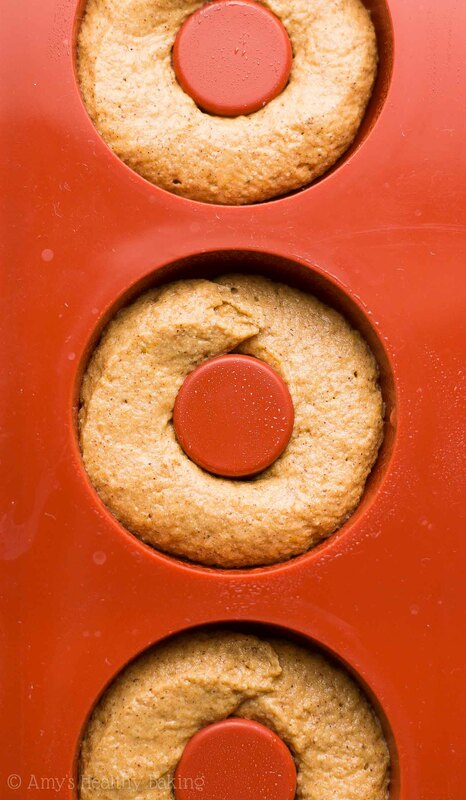 Transfer the batter to a large zip-topped plastic bag, and cut off one corner, Pipe the batter into the prepared donut cups. Bake at 350°F for 14-18 minutes or until the tops are firm to the touch. Cool in the muffin cups for 5 minutes before carefully transferring to a wire rack to cool completely. Just before serving, prepare the glaze by stirring together the cocoa powder, milk, vanilla extract, and vanilla stevia. Dip each donut into the glaze, and place back onto the wire racks or a plate to let the glaze set. Notes: For the gluten-free flour, I recommend the following: 1 cup (120g) millet flour, ½ cup (60g) brown rice flour, ½ cup (60g) tapioca flour, and 1 ½ teaspoons xanthan gum. Most store-bought blends will work as well, if measured like this. If you prefer, store-bought pumpkin spice may be substituted for the cinnamon, ginger, nutmeg, and cloves. I highly recommend using the vanilla stevia! It’s my favorite sweetener, and you’ll use it in all of these recipes of mine, too. (I buy it online here because that's the cheapest price I've found!) If you prefer, 8-12 tablespoons of pure maple syrup, honey, or agave may be substituted for the vanilla stevia. If using this substitution, reduce the milk in the donuts to ¼ cup (60mL). The baking time may change. Any milk may be substituted in place of the nonfat milk. These are the donut pans that I use! They’re made of silicone and a little flimsy, so I just set them on top of a large cookie sheet to bake. When dipping in the glaze, I put the glaze on the side of the donut that was touching the donut pan (so the bottoms!). It’s typically smoother than the top side, so the glaze looks a little prettier! If you prefer, this recipe will yield 12 standard sized donuts. The baking temperature remains the same. Begin checking on them after about 18 minutes. The donuts will be done when a toothpick inserted into the center comes out clean and the tops feel firm to the touch. Don’t own a mini or standard-sized donut pan? Not to worry! You can use a mini muffin pan (you’ll get 28 mini muffins) or a standard-sized muffin pan (you’ll get 12 muffins). For a vegan version, use coconut oil instead of butter, substitute additional pumpkin purée (or non-dairy yogurt) for the Greek yogurt, and use your favorite non-dairy milk in place of the nonfat milk. ♡ …and all of Amy’s healthy pumpkin recipes! Perfect shape! I love how delicious those donuts look like! Thank you for the recipe! My pleasure Valeria! 🙂 I’d love to hear what you think if you try these donuts! I am out of ground ginger but I have fresh ginger root on hand. Can I substitute this? If so, how much freshly grated ginger root should I use? Thanks! I really appreciate your interest in my recipe Allison! I did a little research since I haven’t made that substitute before, and from the results, I think about 1 teaspoon or a little more should work. 🙂 I can’t wait to hear what you think of these donuts! I made them yesterday and just subbed in pumpkin pie spice for all the spices. They turned out great! That glaze is perfection! Beautiful! These look amazing! Just waiting for my donut pan to arrive from Amazon and I’ll give them a try! Do you think it would work for an apple cinnamon version to substitute applesauce instead of pumpkin puree? Just tried it! I replaced the pumpkin puree and yogurt with an equal amount of applesauce, and they’re sooooo delicious. I love this recipe, and your banana donut recipe. I have quite a list of your other recipes bookmarked to try next, I’m sure they will be great as well! Yay!! I’m SO glad that worked out Kyla! Thanks for taking the time to let me know! 🙂 I’m really excited to hear what recipe of mine you try next!! Hi, Amy! I simply love your recipes, thanks for sharing. I also love donuts, but I always get stomachaches when I eat fried goods. So, baked donuts are perfect for me! 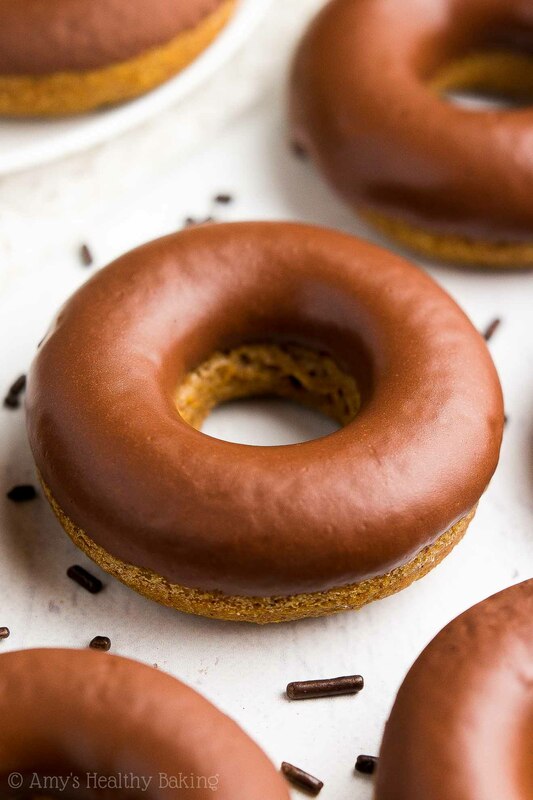 Since I don’t have donut pans here (an they are pretty expensive where I live), I’d like to know if you’ve tried to bake them without using pans, but cutting the dough out, just like kookies. I’ve tried some recipes I found in the internet, for baked cut out donuts, and I still don’t like the taste and texture of them. Any comments from your side? My aim is to have healthy baked goods, for children and grown ups to enjoy. Thanks in advance for your kind reply. Greetings from Chile! I really appreciate your interest in my recipe Claudia! If you don’t own donut pans, then use the alternative that I provided in the Notes section. (It can be easy to miss!) This batter is too wet, so you can’t actually cut it out like cookies. 🙂 I’d love to hear what you think if you try these!